So you a want a startup map? Here’s one. 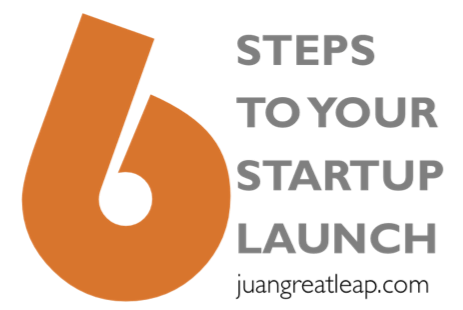 This 6-step process is heavily influenced by my own experiences, and 2 canonical entrepreneurial books: Steve Blank’s 4-Steps to the Epiphany, and Eric Ries’s Lean Startup. Both obvious recommendations. Again, please note the differentiation here between a startup and a small business. For a lot of us beginners, our idea of a startup goes like this: we have an idea, we build a product, market it, and then wait and see if it sinks or swims. So essentially, we take a guess and see if it works. This process IS risky, because if you invest a lot of money in the product development and the marketing, and it fails, that’s it – you’ve lost. In a way, it is also egotistical, because you THINK you know what the market wants, and go to market with it. This was actually how we started, and I wouldn’t recommend it. There is a large difference between: “Oh, if we only get 5% of the market, that’s a million customers.” and that million people ACTUALLY opening their wallets to buy your products. You have to explore that gap. You can largely mitigate the risk by testing out your idea with actual customers and iterating accordingly. Here are the steps. I will cover each of them in detail over the course of the next 6 posts. Links will appear below as the posts are published. When we think of launching a startup, its mostly about art. Steps 1, 2, 3, and 6 are all about art: the art of picking a business opportunity (step 1), the art of selecting your founders (step 2), the art of actually creating a working product (step 3), and the art of selling a product (step 6). Steps 4 & 5 basically incorporates the scientific method into the process. Your MVP becomes your hypothesis, and you basically test it out during step 4. Using what you will learn, you now iterate – and calibrate your MVP. Then test it out again. Until your hypotheses is proven right. Then and only then should you launch. Step one in detail, next! Previous PostNo. 1 regret is interesting, eh? Looking forward to the next installments!